Aside from my loving, supportive Mom and hardworking Dad as well as a couple of smarter-than-me siblings, two of the people who most influenced the course of my life were no doubt Orville and Wilbur. At 22 years old, I made the decision to enter the travel industry by working for Braniff Airlines in spite of having just acquired a B.S. in Nutrition. I have been flying at every opportunity since….addicted to the smell of jet fuel. I have always been fascinated by all forms of flight, whether it be the upper deck of a Boeing 747, or a sail plane with no engine, I have never been able to get enough. 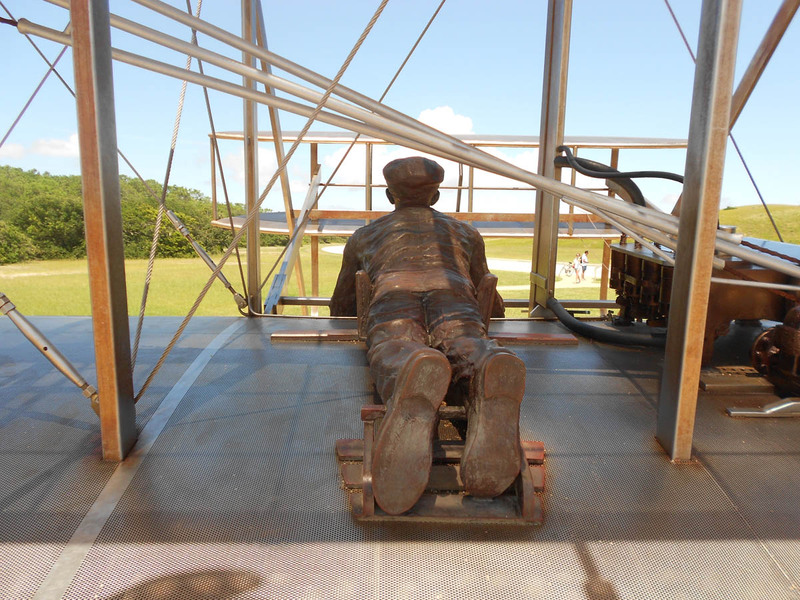 So to visit the Wright Brothers Memorial in Kitty Hawk was like a pilgrimage of sorts for me. I rubbed the heads of both Wilbur and Orville’s bronze statues, giving thanks for the gift of the discovery of flight that has shaped and enriched my life for the past 35 years. “The brothers dressed in coats and ties that December morning – a touch of private ceremony for an event that would alter the world. The pools around their camp were icing up, and the break in the weather might be their last chance of the season. Words were impossible over the engine’s roar, so they shook hands, and Orville positioned himself in the flyer. Just reading that gives me thrill bumps. 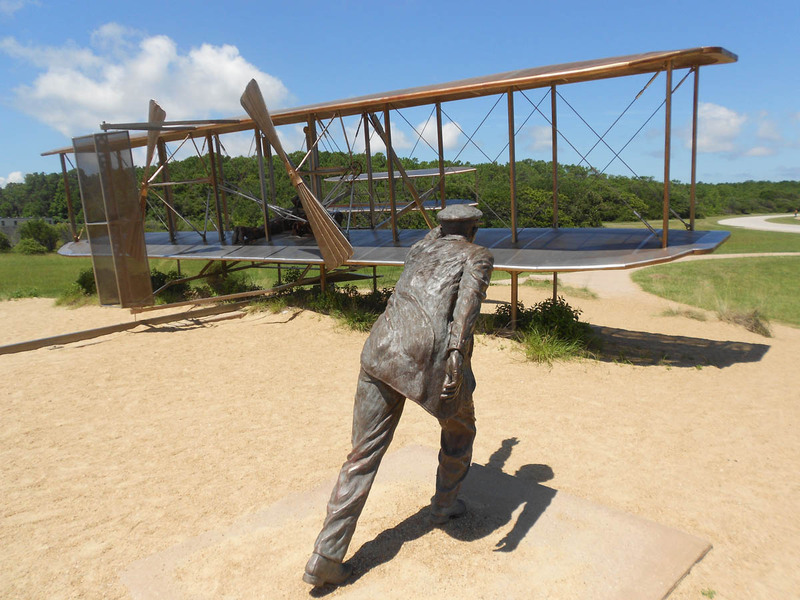 They would make three more flights that day, the fourth and longest being 59 seconds for 852 feet before a gust of wind caught the Wright machine, rolled it over and damaged it beyond what could be repaired at camp. 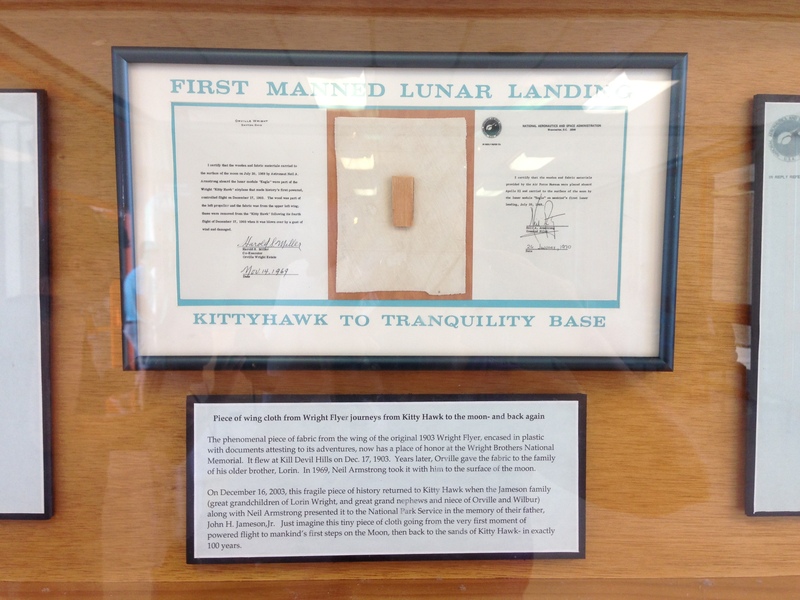 Hard to believe that just 66 short years from this 12 second flight, Neil Armstrong would carry with him a piece of the cloth and wood from the original 1903 Wright Flyer as he walked on the moon, breaking not only the human bond with Earth, but the bond with it’s atmosphere as well. The memorial grounds feature a visitor center with an exhibit building showing a documentary movie leading up to the first flight, as well as replicas of the wind tunnel used to design and test wing shapes, and a life-sized replica of the glider itself. 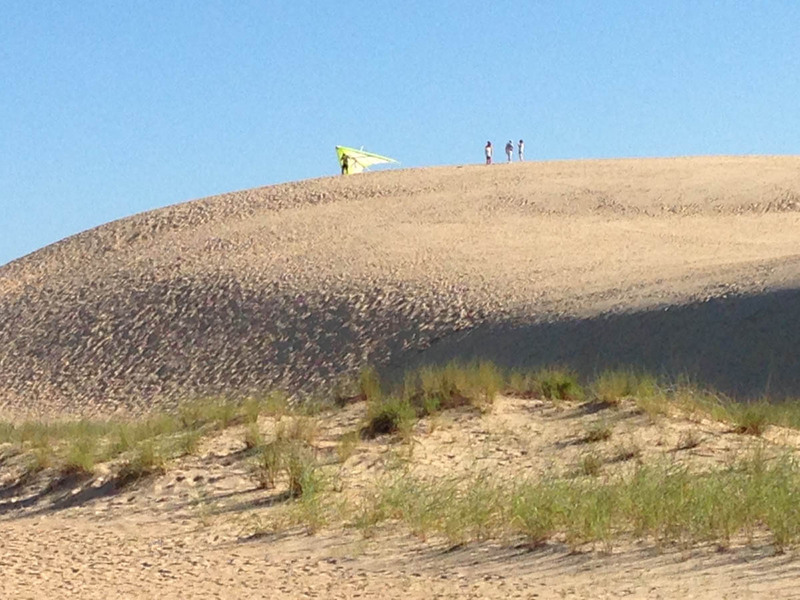 A 60 ft granite “Monument to the Impossible,” dedicated in 1932 sits atop the actual dune known as Kill Devil Hill used for testing the glider. 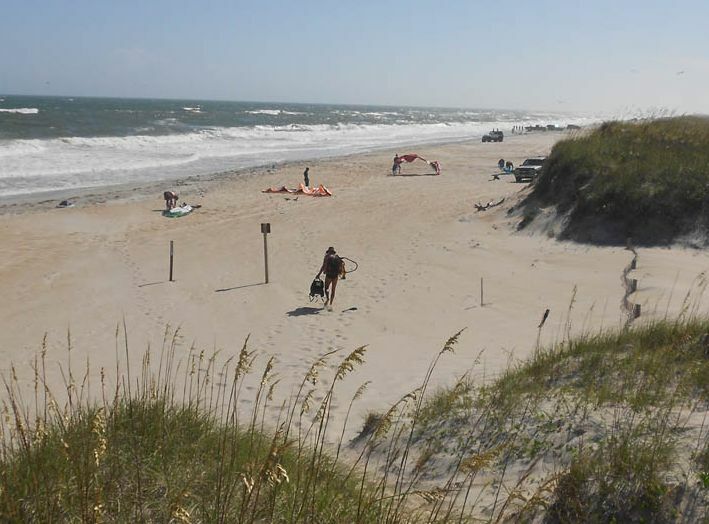 This entire area still draws all kinds of enthusiasts who want to, as one of the Wright’s mentors said, “get on intimate terms with the wind.” Next door is Jockey Ridge State Park, location of the tallest natural sand dune system in the Eastern US, fluctuating between 80 and 100 ft. high. 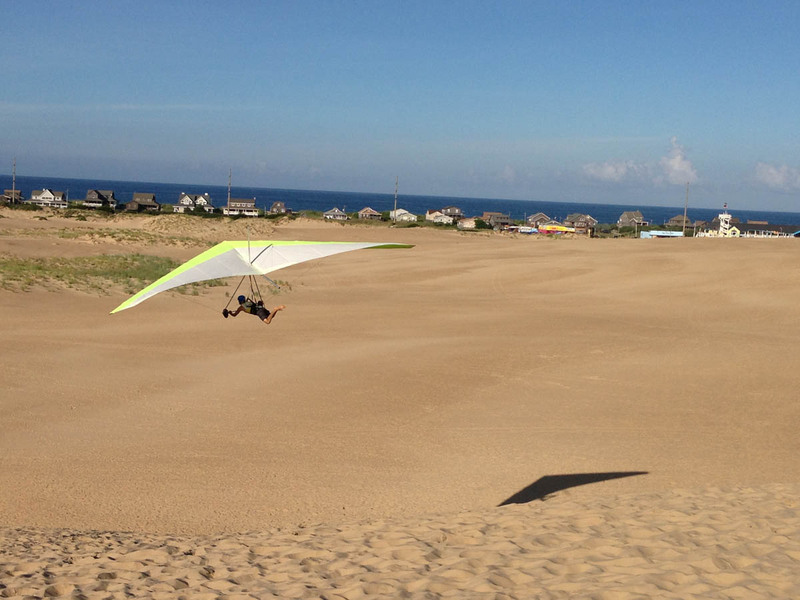 Hang gliding trainees and instructors haul a 60 pound wing up the dune for less than 10 seconds of thrill. As much as I love the feeling of flight, that is not a trade I would be willing to make. 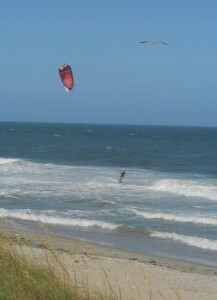 And then there is kite boarding, or kite surfing. 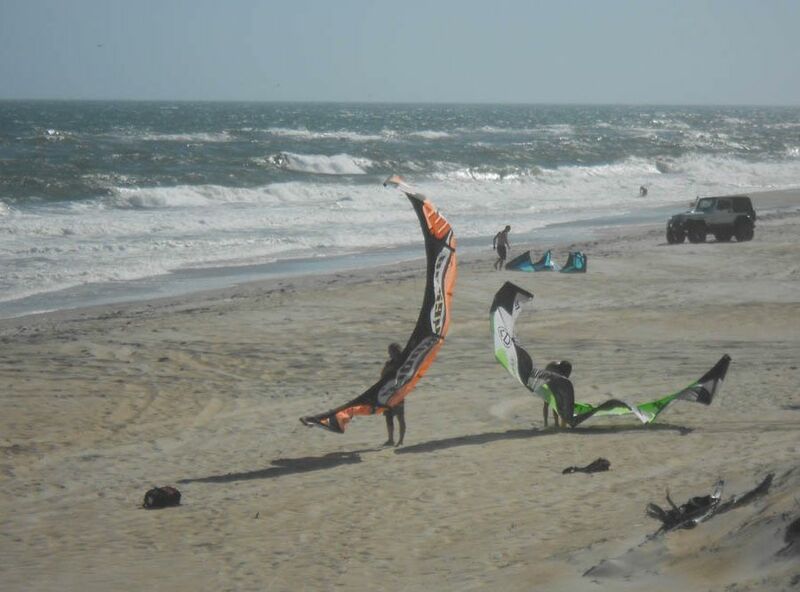 This is a huge sport along the Outer Banks, and on a breezy day, you can sit in your beach chair and watch a steady procession of wave riders fly by in a colorful kite parade. If I were only 30 years younger and 40 pounds lighter, I would be one of ‘em. This looks like the thrill of a lifetime, as the riders are pulled across the crest of the waves, leaping, turning, and surfing back down again. I sat for hours watching as I was seated at the end of the driving beach, so it was a popular entry and exit point. 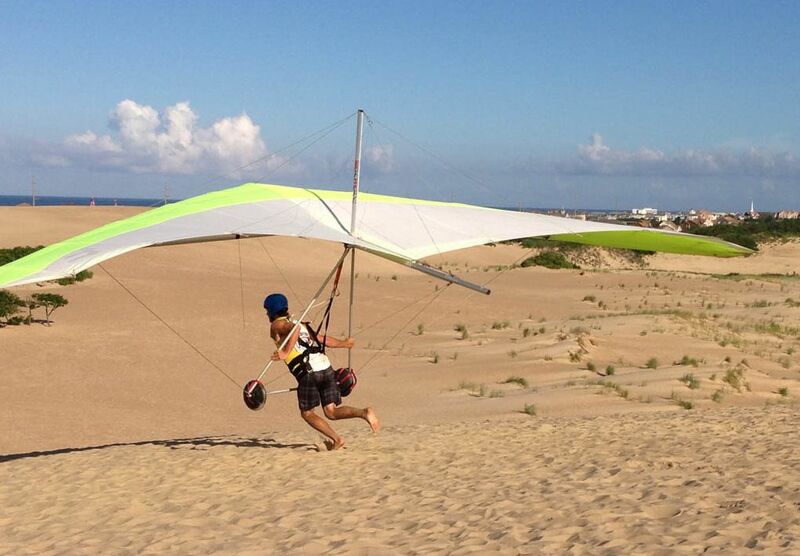 Unlike a traditional kite with structure made from balsa wood, the kite boarder’s kite has an inflatable leading edge bladder and spines that not only give it structure, but also enable it to float should it collapse into the ocean. This kite is hooked to a harness that is worn around one’s waist. The most incredible part, though, is the small board, many which don’t even have foot straps. It is a marvel how riders are able to stay positioned on this board while soaring atop the waves. 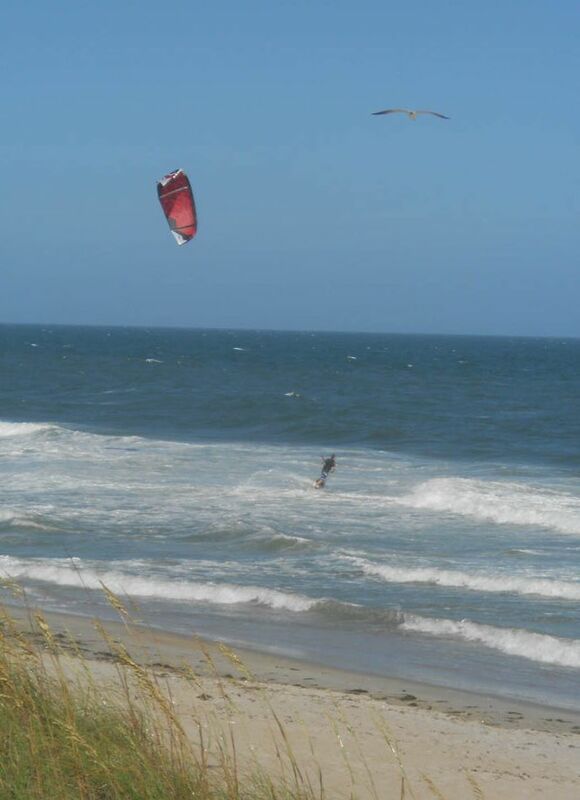 This entry was posted in North Carolina, Outer Banks, State Parks and tagged Jockey Ridge State Park, Wright Brothers Memorial by Suzanne. Bookmark the permalink.